A quarter of the year has gone by. Finding Damo has been dead silent. There are a number of reasons for this, but the main one is: I forgot the first rule of being a writer. That being said, I have been incredibly creative over the past few months. As publicity officer for Nullus Anxietas IV, I’ve written a couple of scripts, a couple of articles, many many press releases, maintained four different social networks and sang Who Will Buy (from Oliver) with completely different words (for Dibbler). I’ve done a lot of film work. 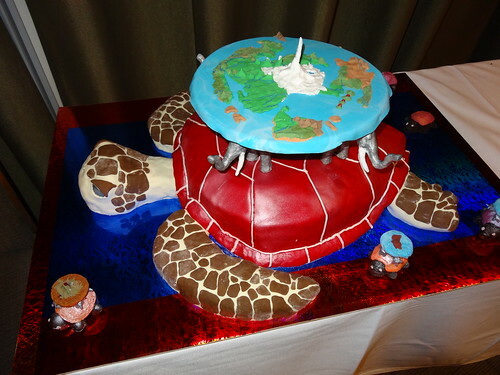 And I worked with Pippa to create a Discworld cake that would feed over a hundred people. With gluten free extras. My family loves having me around again. Shereen called herself the “Convention Widow”, so when I am home, I am loathe to hide myself in a room to write. I have also (shock horror) spent a good deal of time doing my actual job. I’m teaching History for the first time in five years and in my brain, Australian History has always been “marked for Deletion” in case anything more important entered my head – like for example a quote from a Harry Dresden novel. Whoops, there goes the Eureka Stockade! Gone. So I’m filling my head with useful facts, getting the Golden Pen writing club back up (stay tuned for more short stories because of that one) and trying to field a successful debating team. And with the debating competition come the debating topics. Ah, the wonderful topics. Always something to comment on. Should we ban streaming classes in schools? Should stay-at-home parents be paid a wage? Why don’t we just let sports figures take whatever drug they want? It just begs to be taken to the illogical extreme. Sports people are doing drugs. The ones that aren’t are obviously at a disadvantage. Why not just let everybody take performance enhancing drugs, level the playing field and look forward to an infinitely more entertaining sporting experience? There is, of course, the matter of rich nations immediately having an advantage (that’s where the good drugs are), especially in international events like the Olympics. But really, I’m more interested in events like Football, boxing, wrestling. Events where we can expand the sport beyond the limits of our puny human bodies into something truly awesome. Just imagine it: the Pharmaceutical Games. Who cares what that athlete’s name is? He has nothing to do with how well he’s going to perform! If you weren’t worried by little considerations such as ethics and the well-being of competitors, sport could be something I might even tune in to watch! Who cares about fairness in sport? Sport was created as a way for lords to observe the fitness of their soldiers outside of proper warfare. It was war without the death (mostly). In that situation, the person who wins is better and the reasons why they win stop being so important. Fairness? Pah. All is fair in love and sport! I think the Death Race model is one of the better ones. Take convicts who have been sentenced to death. Give them the opportunity to win their freedom in the arena. Make them sign their body over to whichever pharmaceutical company came first in the draft. And let them have a field day. Of course, we could never let these hulks loose on society afterwards. But they don’t have to know that, do they? Where’s the drawback? I see no way that this could go horribly wrong, only to be resolved in around 120 minutes of bloody action! I think I should take a break now. Gain some perspective. I’m back on the weekly blog schedule, and have some keen insights in store for 2013. BTW, I’ve started writing again. This week was a one-act play and a short story. Finding Damo (the novel, not the blog) is calling to me. I’ll post word counts next week.